Now, this is not to imply that it isn’t a delight to watch. It has A+ casting, dreamy L.A. aesthetics, and a creative team whose elite teen soap pedigree is felt nowhere more distinctly than in than in the perfectly pitched sun-blasted soundtrack following these unevenly superpowered teens around town. It has Gregg Sulkin finally killing an American accent in his fourth teenaged iteration, and the first fictional all-powerful Internet/mobile operating system I’ve ever seen whose UX design is consistent and believable. The Runaways and their parents are diverse in a way that is simultaneously pointed (as is underscored in the “Discover Los Angeles” promo spots in Hulu’s commercial breaks) and utterly, easily, naturally unremarkable. There’s a selectively empathic dinosaur they keep teasing us with! That elite teen soap pedigree, keyword soap, that creators Stephanie Savage and Josh Schwartz bring to the project, is hobbled by the entirely unsoapy sprinter’s pace of a 10-episode season. Those dreamy L.A. aesthetics, so sun-chillingly evocative in Imaginary Forces’ washed out, noirish title sequence, wind up taking back seat too often in service of getting basic story beats, most of which take place in the same half dozen locations, spit out. That A+ casting, spread across 17 central characters, leaves the show with too deep a field for any character to have the screen time to develop in a believable and earned way, nevermind any relationship between characters. It is this last point that is especially frustrating. Each of the Runaways is exceedingly charming on their own, as a promise, but without the (ahem) runway to develop their personal stories outside of obligatory romantic side stories, that charm doesn’t mean very much. 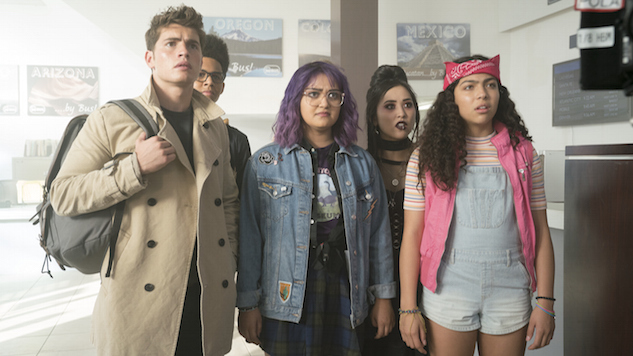 Gert (Ariela Barer) is introduced as a spitfire warrior for social justice, but her practical initiatives in that realm fall to the cutting room floor the moment she’s handed the sides of a love triangle to react to, or a dinosaur to be immediately emotionally attached to for no reason she or any of her friends seem at all curious about. Sulkin’s lacrosse bro/mechanical genius, Chase, is introduced as someone who’s dedicated so much time and physical energy to preparing to defend himself against his abusive father that he might as well have joined fellow PLL alum Cody Christian over on Teen Wolf (he got super jacked, I mean), and yet every meaningful interaction we see him have with his major foils after that introduction—both romantic (Gert, Karolina) and familial (his abusive father and abused mother)—sees his allegiances turning on the kind of pin that would allow no time for anyone to get even a bit jacked. Karolina (Virginia Gardner), meanwhile, excels at the clear-eyed, unruffled faith she’s meant to evince as the daughter of the leader of the bright-white, lightwave-worshipping religion that is definitely not Scientology, but then rebels with no warning or real reason, and is declared by Gert to have a strong and obvious crush on [spoiler], despite showing no obvious bubbling of feelings for nor sparking chemistry with said crush beforehand. Most egregious of all, Alex (Rhenzy Feliz), despite being presented as the ostensible heart of the Runaways, fades into the woodwork almost immediately after bringing the group together in the pilot, spending the majority of the season stuck in a loop between his crush, Nico (Lyrica Okano), and the villainous parental secrets Nico’s tech mogul mother has locked in encrypted files in her office. His role as hacker is critical to the Runaways’ mission, insofar as they have one, but it also relegates him to finding new and exciting ways to tote around an encrypted tablet for half the season while the rest of the Runaways do… kissing. Which he also finds time for! But that isn’t character development so much as a teen soap obligation. Ultimately, only Nico and Molly (Allegra Acosta) have emotional arcs that feel grounded and are given the time to evolve slowly and come to conclusions that feel earned, and that is fully because those arcs—Nico’s volatile relationship with her intimidating mother and their warring grief over her sister’s apparent suicide; Molly’s frustrated relationship with not only all the older Runaways but also her adoptive parents, both relationships which come to a head as she develops legitimate superpowers that are tied to the mystery of her dead parents, and which the older Runaways are initially too wrapped up in their own business (mostly, kissing) to take seriously—aren’t tied to romance of any kind. Nico’s two romantic stories, meanwhile, turn on such minuscule build-up that they have equally minuscule impact. There is a similarly disappointing dynamic at work among the Runaways’ parents, whose initially rich personal arcs are a rare treat in teen-oriented fare, but who are equally prevented from developing those arcs in a compelling way for little reason other than, there’s just no time. What is clearly a complex and emotionally complicated history in the ostensibly charitable Pride group—which the kids realize in the pilot is actually a cover for the mysterious, ritualistic murder of runaway teens—is rendered at turns dull and infuriating as the limitations of time and a mandate for a last-act twist force every conversation the adults have to be in the most heavily weighted, passively constructed abstractions. “So much has been sacrificed, but it will all be worth it,” “After all these years, our obligation will finally be over,” “The Hernandezes were taken care of,” “Take care of Molly, or we will,” “If word of this leaks to Jonah, he will take care of it,” “Everything Pride has worked for, it is finally here,” “This is for the good of the world.” And so on, ad passive infinite nauseum, because all the time the eight parents of Pride have outside of simmeringly enduring their broken marriages or bullheadedly shouldering together through mysterious blackmail or comically jawing about the science they would be doing if not stuck killing teenagers as part of Pride’s master plan is only enough for mysterious code and implication. All of this is to say, the problem with the storytelling on Marvel’s Runaways is one big cliché: It depends too fully on telling, and not nearly enough on showing. This seems impossible considering the teen soap royalty at the creative helm (and Marvel’s Runaways comic writer Brian K. Vaughan on board behind the scenes), but becomes more easily explicable when taking the fact of how short a 10-episode run really is, especially for such a broadly cast, thematically ambitious project. Again, Amy’s initial review hit the mysterious, magic-rock-drilling nail on the head: “What’s off about the series is that there’s simultaneously a lot going on but also not enough.” The best two episodes of the series thus far have been the first two, in great part because they took the time to tell the same story from two different perspectives—first, the kids’, then Pride’s—giving each enough breathing room to be compelling and evolve the characters and plot in ways slow enough to be interesting. Had Marvel’s Runaways come out swinging with that as the plan for the whole season, everything going on might actually be enough. Of course, the novelty of that format might wear off over the course of a whole season (I’m more game than the average viewer, probably, to be put through storytelling experiments), but at the same time, taking a break between perspectives would introduce more natural tension into the story currently being forced by breakneck relationship twists and passively ominous parental declarations. Sure, that would put the series at an episode order closer to that of pre-Peak TV full seasons, but teen audiences, when they love something, are voracious. Twenty episodes of a show worth loving is, well, worth it. Ten episodes just smacks of adult prestige BS. Barring Stephanie Savage and Josh Schwartz taking up this critic’s unsolicited advice for any future seasons, should Marvel’s Runaways want to stake a real claim in the next great era of teen television, rather than just stay poised forever to maybe do so, one day, should all the stars align, they could at least end the Season One finale by running away. It won’t solve the pacing problems, but it will at least halve the number of interactions they have to have with the rest of the cast. Season One of Marvel’s Runaways is now streaming on Hulu.